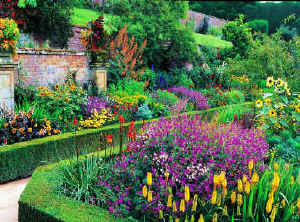 This famous 17th century garden at Powis Castle was based on designs from William Winde. Powis Castle is in our top twenty of the most beautiful gardens in the British Isles. There are magnificent planted terraces including an Italianate terrace inspired by the palace of St Germain-en Laye in France. Plants on the walls at Powis Castle include roses, budlias, pomegranates and other rare plants and sub tropical plants. You will also see some of the finest and largest yew hedges anywhere. The kitchen garden has been converted to a flower garden in 1911 by Lady Violet and there are lovely colours every where. Rhododendrons and azaleas add colour and there are rich autumn tints. The Castle once lived in by Princes Powis has beautiful state rooms and is finely decorated. It has collections of paintings, sculpture and furniture. Powis Castle and Garden Open 2019- open most of year - see website for details. If you want to find places to stay near Powis Castle and Gardens, why not stay in one of our recommended hotels. Each hotel has genuine guest reviews enabling you to book from anywhere in the world in total confidence. Not only do we feature hotels near the garden, we also feature hotels worldwide and at all major airports. Special prices up to 70% off standard rates as well as hundreds of exclusive deals. Look now - click here.